How to connect a social account to OneStream? How to disconnect a social account from OneStream? Sign in to OneStream Dashboard. On the sidebar, click Accounts. Click Add account to connect a social account to OneStream. To connect a social account, click on the button under the desired social media platform. For example, to connect a Facebook Page click on the Page button, and so on. You will be asked to login to the social network to access it&apos;s pages, groups or channels. After authorisation, social accounts list will appear. 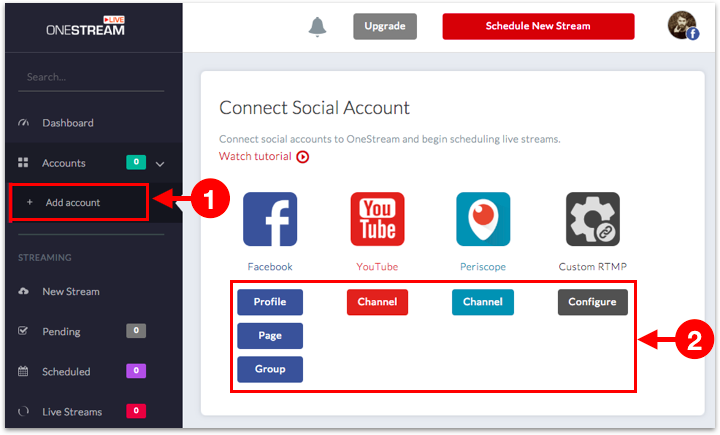 Choose the social account and click Connect to OneStream button. Once the social account is connected, it will appear on the sidebar under Accounts.